The research group Biophotonics was founded at the Kirchhoff-Institute for Physics in 2009. We investigate applications based on photonics in the field of biology, chemistry and medicine. Thereby optical methods like microscopy and spectroscopy are developed to get new insight into intra- and extracellular processes. One major issue is to distinguish between essential biological substances in vitro as well as in vivo. There is seen high potential in those methods to be future applications in medical diagnostics or as a method for bio-chemical institutes. For example sensors to continuously control physical functions or screening methods for fast detection of small amounts of specific substances. Our paper K. Haase, et al. 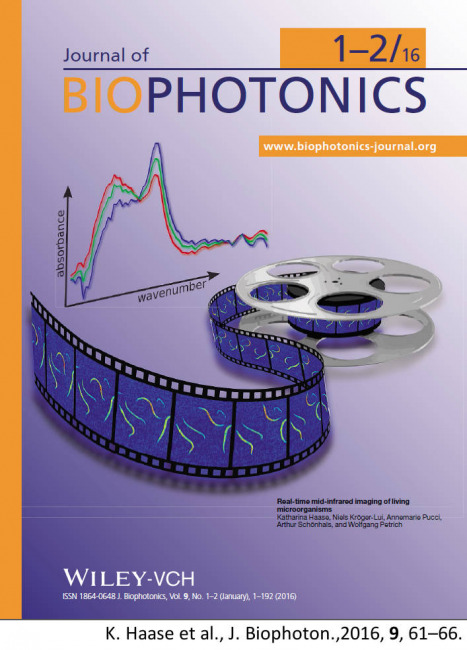 Real-time mid-infrared imaging of living microorganisms, Journal of Biophotonics, 9 (2016), 61-66 got chosen for the cover of Journal of Biophotonics Vol. 9, 1-2, 2016. Our paper N. Kröger-Lui, et al. Rapid identification of goblet cells in unstained colon thin sections by means of quantum cascade laser-based infrared microspectroscopy, Analyst (2015), got chosen to be on the cover of Analyst Vol. 140, April 2015. FD VibSpec (concluding remarks): Translating vibrational spectroscopy into clinical applications - vision or reality?